We're obviously huge fans of Kim Kardashian's style over here—we've even gone as far to try out her looks for ourselves. And since her great 2012 makeover at the hands of husband/designer, Kanye West, we've noticed some tried and true constants (née konstants) to her look. 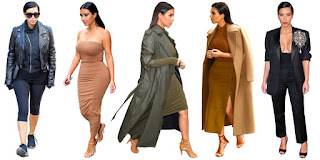 Here, we look at the 9 things that Kim uses as her uniform and show you how to get the exact same things.